Fishing and hunting related reviews, guides and articles. 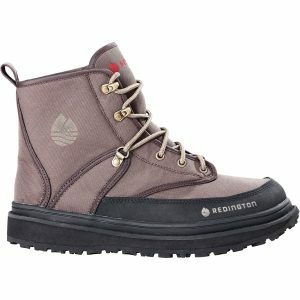 The Redington Palix wading boots cost around 80$ and are therefore in the mid-price segment. They come with rubber or felt soles and are honestly really good looking. Since this should not be your number one criterion when buying this kind of gear, let’s see what else they offer. Redington is brand with a fairly good reputation in the scene. They produce quite a few high quality products for example the Skagits, wading boots a bit more expensive, or the Sonic Pro, one of my favourite pair of waders. The Redington Palix come with a rubber or a felt sole, personally I would always prefer rubber over a felt one though. Not only do they give- if well made- almost enough traction, to compete with felt they also have a far longer lifespan which I value a lot. I tend to walk long distances while fishing, chasing from spot to spot and because of this felt is not an option for me and if you are similiar get some sticky rubber soles as I did here. The soles used here have are a little special. Redington decided to implement crushed walnut shells to the rubber to make it even more stickier. If this makes a huge difference, I can’t tell. At least you can brag with it on the river. The rubber is soft and that’s exactly what you want here. It gives them more traction in the water and I can talk from experience from other Redington boots I wore before. Their rubber is actually pretty sticky. However if this should not be enough for you, you can add studs to the sole, which is an easy process and will give you even more traction. They used a polyester mesh for the upper part of the boots, to give them a decent drainage system, letting water easily flow in and out. 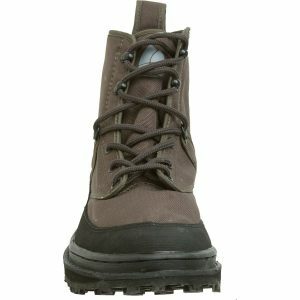 If this is your first pair of wading boots, this might shock you, but they are actually designed to do just that. Since water will enter them anyway a really important feature is, that it leaves said shoe again. This brings them back to normal weight and is less exhausting for your legs. You can choose between two colors here, the colors “bark” and “basalt”, or in boring: brown and beige. The seams look like quality on the first look, as far as I know, this is slightly misleading. A friend of mine wore them the whole season 2015 and some of the thread used on his boots started popping. Maybe they did some improvements here, since I really couldn’t tell that from my pair. Top over your toes is protected by a rubber cap, improving their longevity while at the sime protect your toes if you bump into stone with them. Trust me, it helps and is not a feature you should underestimate. The rubber used here seems hard enough and should do the trick. The weight is, as mentioned early lighter than you would expect when you see them first. The Palix use a “deep draw lacing system” which refers to the one lace ring they placed further outside. This will press the sole and the outer parts of your boots further together and makes sure that no debris get through that little gap that would be there otherwise. Gravel guards only reach so gar. The manufacturer left out all the fancy collar padding here, that everyone else in the industry does. Nevertheless, the Redingont Palix are comfortable. Really comfortable. You will want to walk in them. They run a little big, which read before ordering them so I ordered my exact shoe size and they fit fine. Do not order larger here as you might be used to, Redington already thought about that for you and adapted. I guess it would be even nicer if they would point that out more visibly. I will combine my experience and my friends, whom I mentioned earlier. I wore them, as always in a rocky river with a lot of moss and a lot of dead leafs everywhere. As expected, the traction you get in this boots is awesome. I felt safe walking from side to side over stones everything you could encounter. Redington knows how to make soles. The ankle support is also decent. You do not need three times padded collars for that. It works fine without.I asked my friend how they perform over time and he assured that the traction is consistent, even after one season. I did not try the the studs, since I just did not need them. But you can be sure that wading boots with studs work even better. One thing I did not like though was the drainage system. The water stayed in my boot slightly longer than what I am used to from my everyday fly fishing boots, the Redington Skagit. But his is criticism on a high level. Redington showed us once again, that they know how to make good wading boots for the money. The rubber they use always convinces me and I generally enjoy wearing them. If you need a nice pair of wading boots for fly fishing and do not want to spent 100 dollars or more the Palix are the best choice, as you can see in our best wading boots ranking. Frogg Toggs Cascades Review: Are rubber waders still worth buying in 2016? Enjoyed our article? Your friends might too! Sharing is caring! Do those work good in combination with their Palix waders? Did you try them by any chance? 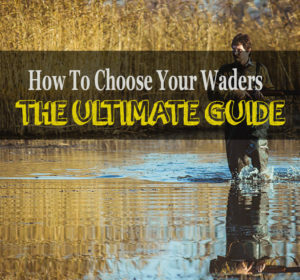 In fact we didn’t try the Palix Waders yet. Redington claims they work great together and the Palix waders are a great choice according to many fly fishers.